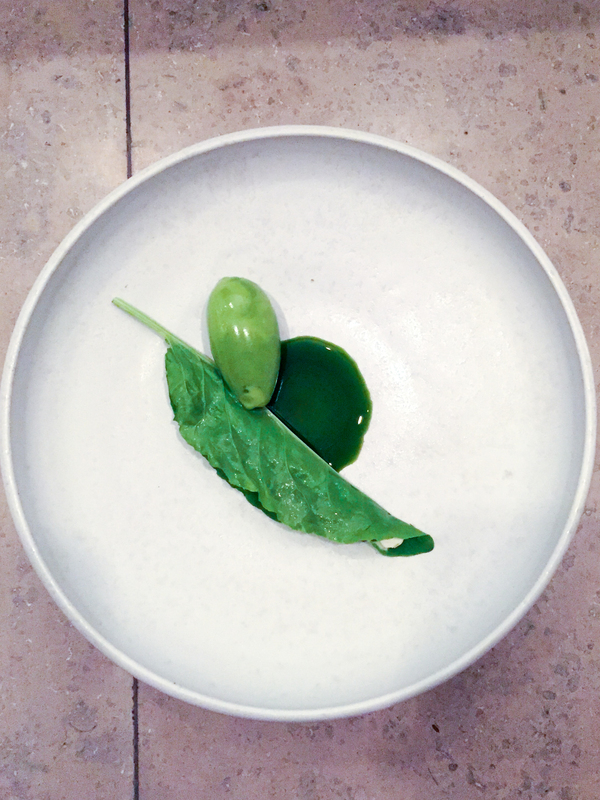 Located on the top floor of a historic building in Copenhagen overlooking the harbour, Studio is an award winning, open kitchen restaurant and one that I was looking forward to ever since I learned that I was going to Copenhagen. After a beautiful spring evening stroll along the waterfront, it was time to see if Studio would live up to the much sought-after Michelin star. I was booked on the ‘Chef’s table’ which was the counter right next to the kitchen from where I could watch the chefs create. The restaurant itself is a warm open setting with great views over the harbour with a great vibe and buzzing energy. After settling with a glass of Krug champagne and looking over the menu, I decided that there was only one way to go – the ‘Full On’ with wine pairings (of course). I was, theatrically, welcomed with a refreshing gooseberry citrus drink by Executive sous-chef Bjarke von Holck, who was leading the team this particular evening. 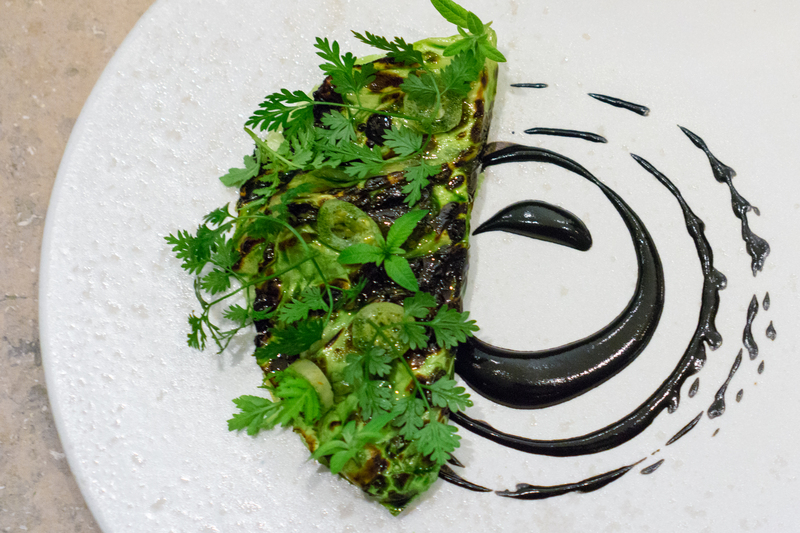 Chef von Holck took some time to explain the menu and concept for the night and exuded confidence and pride – I had a really good feeling about this meal. Various ‘snacks’ were served and each one was presented beautifully and playfully. 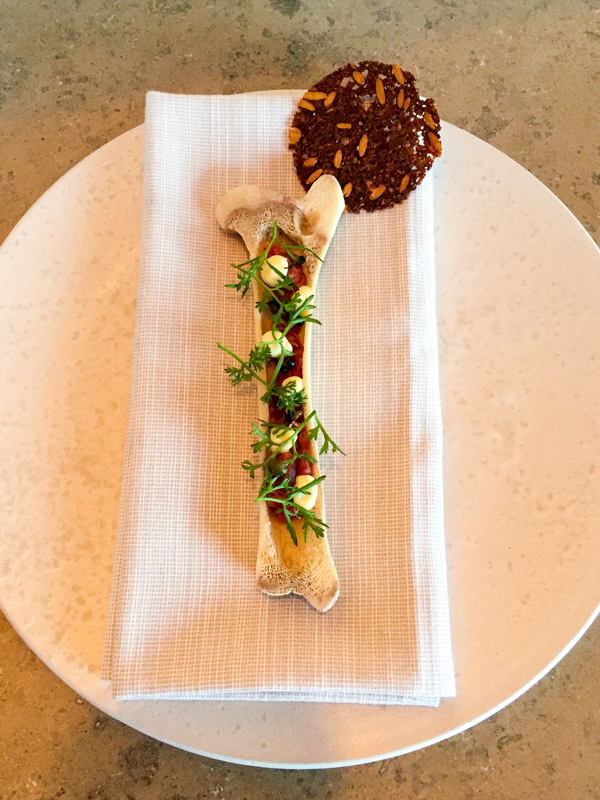 The Potato Crisp with Roe was light and refreshing; the oyster with strawberry, coriander and dill weed – wow what can I say? A soft boiled quail egg with burned salt, an amazingly flavoured tender Beef Tartar served in a bone and finally an Aebleskiver (danish doughnut) served with roe and cream cheese. 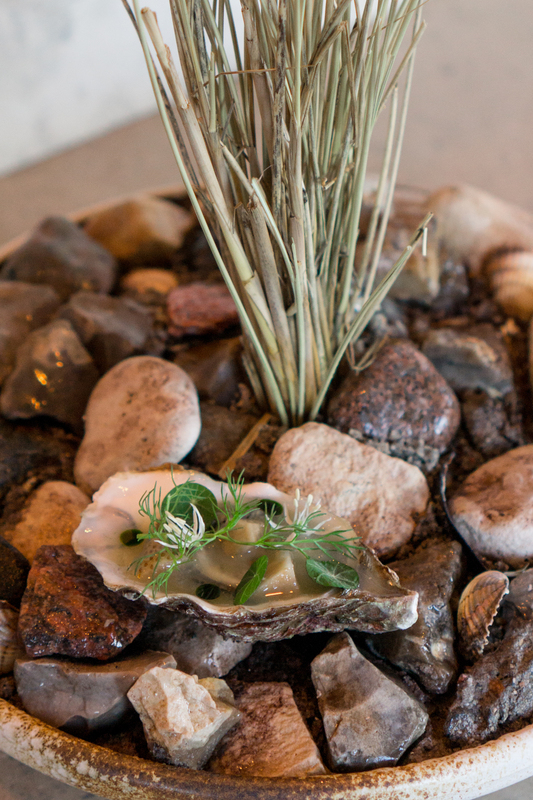 These amuse-bouches were all equally fantastic but if I had to choose one, I’d say that the oyster really did steal the show on this course. The menu started off with a Krug and Caviar course – sturgeon caviar served with walnut milk – a lovely creamy start. This was followed by a piece of Flounder delicately deboned and cooked to perfection. 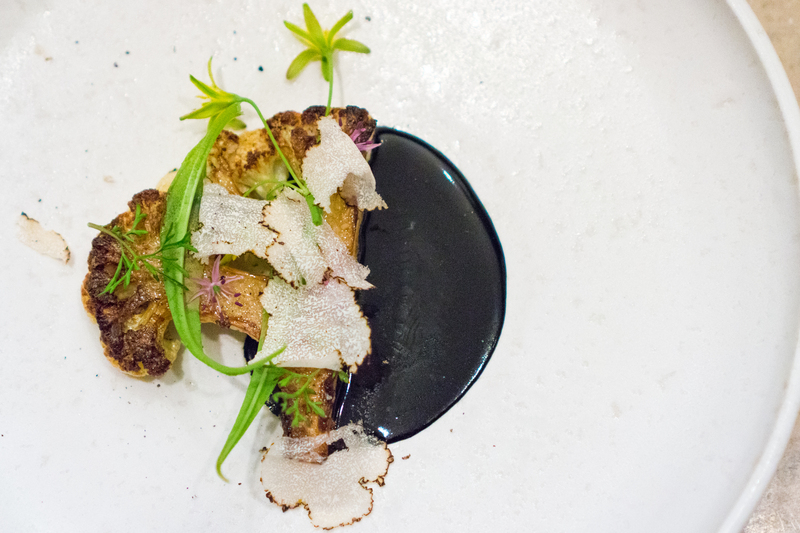 A simple pan seared piece of cauliflower served with black truffles and balsamic sauce followed and, despite the inherent simplicity of the dish, it all came together really well and the sauce and truffles really added robustness to the flatness of the cauliflower. Probably one of my favourite dishes of the whole night was served next and again it was heavenly simplicity. 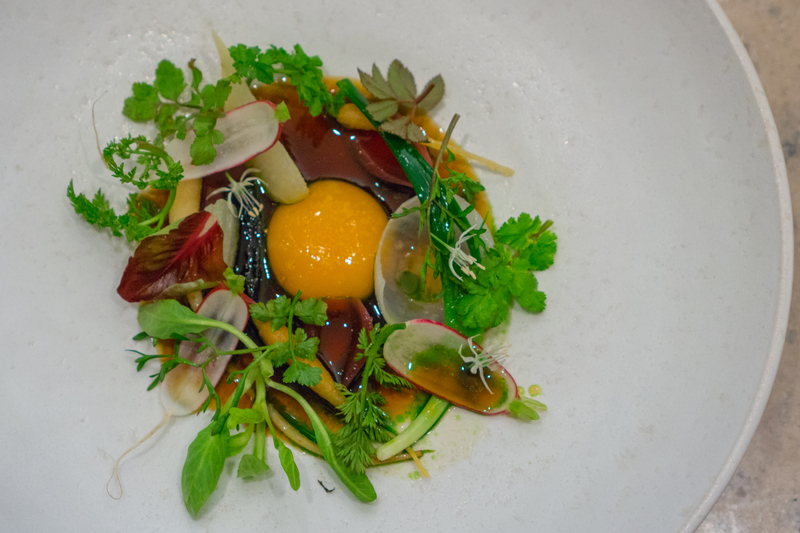 A poached egg yolk served with an assortment of local spring herbs and vegetables with an onion bouillon. The creamy yolk with the crunch of the aromatic herbs all bathed in the onion bouillon, added just as the dish is served to prevent everything getting soggy, all came together in my mouth and put every taste bud through the whole range of flavours and textures that they were capable of. The onion bouillon was the best I’ve ever tried and, honestly, they could have served me that in a wine glass and I’d be happy! Next up were the veal courses starting with a veal sweetbread wrapped in cabbage and topped with ample herbs. Truthfully, this was in great contrast to the light refreshing egg yolk dish just prior and even though it was a well executed dish, I did feel that it did break the flow of the menu a little but that was soon forgotten with the veal main course – a perfectly cooked medium rare piece of veal served with plenty of herbs and flowers! The dessert course was based on the transition between winter and spring and started with a beautiful ball of Seabuckthorne with white chocolate and liquorice – it was so nice to look at that it seemed a shame to break it open but all my shame melted away as the delicate dessert melted in my mouth with just right amount of sweetness and freshness. Also served was a dessert celebrating sorrel and to round it out a chocolate covered red rhubarb flodeboller served with an educational fact sheet extolling the virtues of rhubarb! 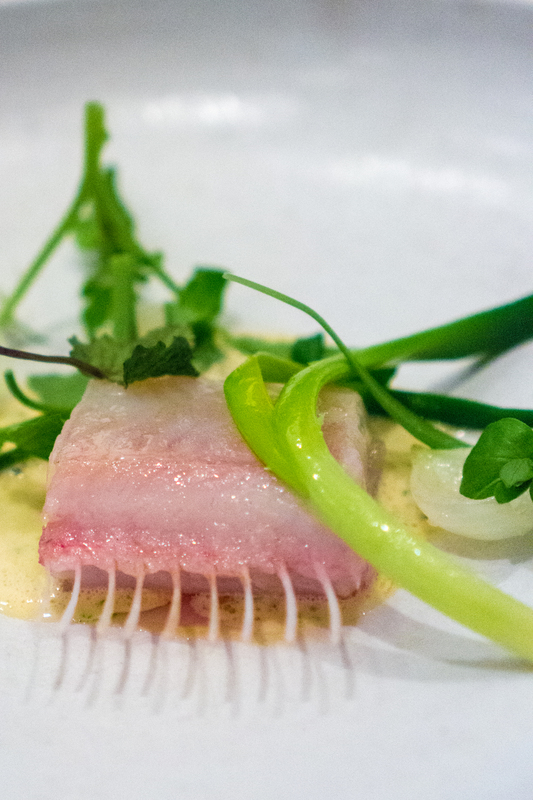 Chef Thorsten Vildgaard is flirting with greatness with his restaurant Studio. His deputy, Chef von Holck inspired the kitchen team on this night and the dinner sitting was a great success. 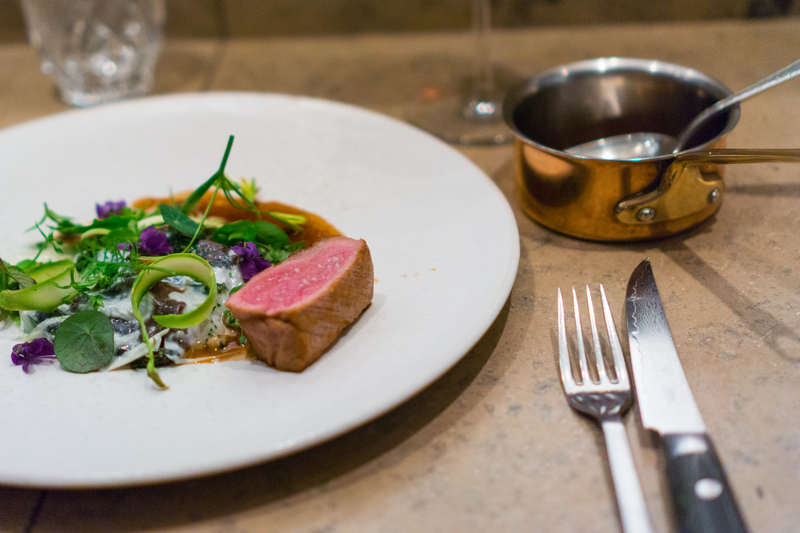 The attention to detail, flavour, presentation and service are all apparent and thoroughly deserving of their Michelin star. If it were up to me, I’d fly back and carve another one into the counter! 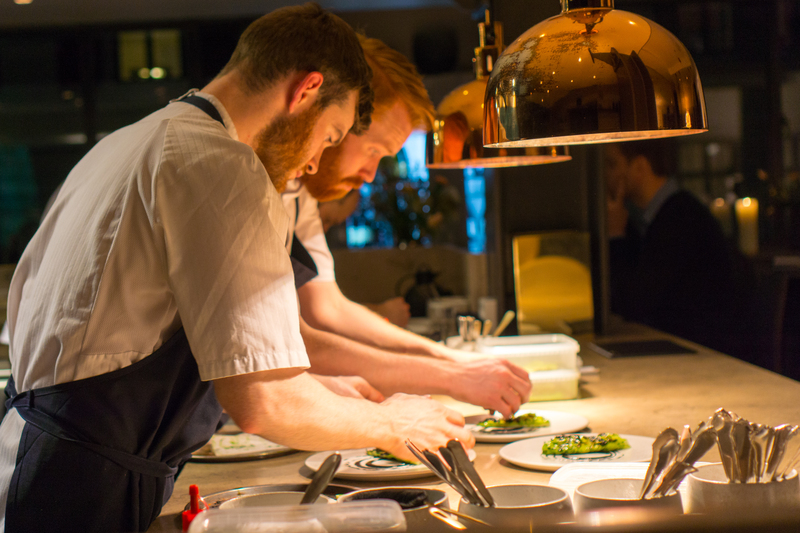 All food served at Studio will be prepared and served from an open kitchen in the restaurant, which from the first floor space at The Standard offers an exquisite view of Copenhagen harbor.